ST. GEORGE — The race for the rock has begun in Summit Athletic Club’s annual “Find the Rock” adventure promotion, and six rocks are up for grabs this year in celebration of six years of searching fun. 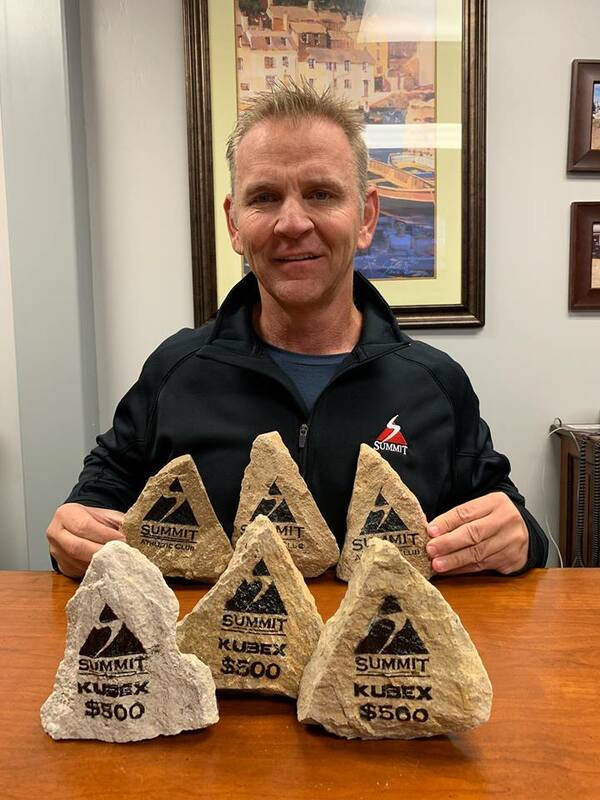 In an effort to get everyone into prime rock hunting shape before the main competition, this year three mini-Summit/Kubex rocks have been added worth $500 each. The third and final mini-rock’s value will double to $1,000 if the person who finds it is wearing this year’s official Summit Rock T-shirt. As to the bigger rocks, as with previous years, each rock will be worth $5,000 – unless the person who finds them is wearing the T-shirt, in which case the rock value doubles to $10,000. Three thousand of the highly necessary black shirts with hidden clues are available for purchase at Summit’s Bluff Street and River Road locations for $10, but once they are sold out, no more will be available. As a bonus, you also get the privilege of using Summit Athletic Club for the entire month of November as long as you’re wearing the 2018 Summit Rock T-shirt. Participants do not need to worry that finding one of the lower-valued rocks will knock them out of the competition entirely, because while all current year mini-rock winners are not eligible for any other Summit mini-rock contests, they will be still eligible to participate in the Summit Rock main contest for the $5,000 rocks. The sleuthing for the mini-rocks officially starts Wednesday at 10 a.m. when the first clue will be sent out to email subscribers of 99.9 KONY Country, 95.9 The Hawk, Planet 105.1, Easy 101.5 and St. George News. At 10:30 a.m., the first clue will be posted on the individual radio stations’ apps, which can be downloaded on any of their websites. More clues will be released on the apps and on-air every half hour starting at 11 a.m. until the rock is found. The second mini-rock search will begin Thursday at 8:30 a.m. with a clue release on-air and subsequent clues on the stations’ apps every hour. For the final mini-rock – and in preparation for the hunt for the $5,000 rocks – join DJs from the four radio stations for a rock party kickoff celebration Friday at Summit’s River Road location starting at 5:30 p.m. New clues for the final mini-rock will be released starting at 5:45 p.m., with subsequent clues every 10 minutes until found. Remember to wear your T-shirt, and if you find that final mini-rock, it will double in value. On Oct. 29 the search for the $5,000 rocks will ensue. KONY Country DJ Marty Lane jokingly said his fans may have the best chance of winning because all three winners last year were KONY listeners. Clues will begin at 8:30 a.m., Monday through Friday and the second rock release will be on Nov. 5. This year, in response to numerous people who said they had to work during search times in previous years, a final one-day-only search for the last rock will be held on Saturday, Nov. 17, starting at 9 a.m. with new hints let go at the top of every hour. “One day. One rock. $10,000. Doesn’t that sound good?” KONY DJ Amy Chesley said. Once the first rock is found, the contest starts all over again with new clues on the location of the second rock. Once the second rock is found, the contest starts all over again with new clues on the location of the third rock and once the third is found, the contest is complete. Canyon Media and Summit Athletic Club realize this is a large sum of money and many of you will be looking for the rocks. So they ask you to please adhere to all rules, be careful and have fun! The full listing of rules can be found on any of the radio stations’ websites. For more information and continuous updates about the “Find the Rock,” giveaway and its clues, sign up for the St. George News email subscription below each article or on banners on our main homepage today and never miss an important beat. KONY fans can also sign up for the KONY Club and receive weekly emails about upcoming and ongoing events, contests, promotions and so much more. Wow ! Talk about one GIGANTIC sponsored advertisement !